As expected, Apple has just released iOS 6 to the public, making the download available to users of recent iPad, iPhone, and iPod touch models. Users can obtain the update either by connecting their devices to iTunes and clicking the "Check for Update" button or checking for over-the-air updates on their devices via Settings -> General -> Software Update. It may, however, take a few minutes for the update to propagate to all users. 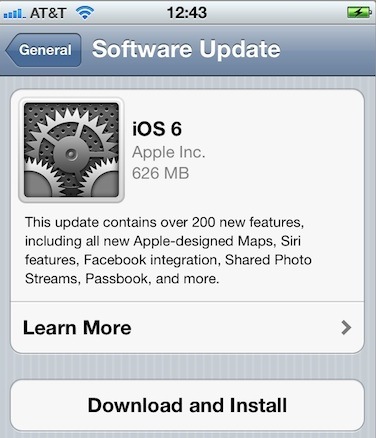 iOS 6 adds over 200 new features, including Apple's own Maps app, Facebook integration, Siri improvements, Apple's new Passbook digital wallet app, and more. Discussion of the new operating system is ongoing in our iOS 6 forum. iOS 6 is compatible with the third-generation iPad, iPad 2, iPhone 4S, iPhone 4, iPhone 3GS, and fourth-generation iPod touch. It will also ship on the iPhone 5, which launches on Friday, and on the fifth-generation iPod touch launching next month. The operating system arrives as the golden master build 10A403 for existing devices, and Apple has also posted a special 10A405 build for the iPhone 5 and a 10A406 build for the upcoming fifth-generation iPod touch. Nothing in Houston, TX either. Except humidity. Not upgrading, waiting to use iOS 6 on my new phone! Update not yet available on my side..
Why are some able to download it and not all? Apple's software release team visits MacRumors and assesses who has been naughty, who has been nice, and releases accordingly. Ok, someone do it on their 3GS first and tell me if it's not as bad as iOS 4 was on 3G. Curious if it's the same as the GM (6.0 10A403). It could take hours for the update to propagate to all devices. I think we all just need to be patient and pass the time by clicking refresh on our UPS tracking page.